This large villa and working cattle ranch are perched above it all in the hills between Sosua and Puerto Plata. 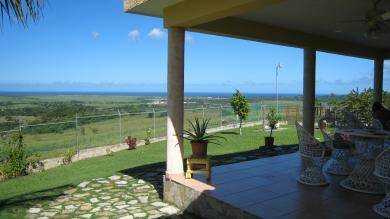 Sitting on your terrace, overlooking 20+ Acres of sloping ranchland, you have unobstructed views of Isabel Torres Mountain, and a full sweep of the Atlantic Ocean. Where the ocean ends, the mountains begin - this is truly a spectacular piece of land, located near the Brugal Country Club. The 5 bedroom, 3 bath villa has a spacious open floor plan with soaring, wood cathedral ceilings. Three bedrooms share one wing, and the master bedroom and bath comprise another wing. A fifth bedroom with full bath can also be used as a separate maid's quarters. The large modern kitchen and open island area is a great place to entertain and share time with friends and family. This is a working, well-maintained cattle ranch, with all the equipment, buildings, scales, etc. that you would need to continue working the ranch. This land could also be easily subdivided and developed with gorgeous views for all parcels. An additional 11 Acres are available for $352,000 - see listing DR01-BL6012AB. A Truly Exceptional Property and Opportunity.